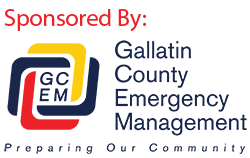 (Gallatin County Mont.) Thursday about 11:15 a.m. a 21 year old MSU student from California was skiing north of Bridger Bowl when he collapsed a vw van size cornice and fell on the north side of Duanes Bowl. He was unhurt but unable to descend or acend due to snow depth, steep terrain and being unfamiliar with the area, He sent his girlfriend a 20 year old MSU student from Illionis back to Bridger to get help. She met Eric Mullen (off duty ski patroller and Sheriff’s Search and Rescue hasty team member with a radio) at the top of hidden gully. Eric called the event in and started to the scene with the witness. Two additional SAR members that were sking at Bridger, Scott Gill and Phil Sgamma were dispatched the the scene with additional gear. The Skier was raised with a 3:1 pulley system of ropes and brought back to the ridge by 2:30. The party was hiked back south via the ridge into the ski area. This area was about 200 meters north of the bridger bowl boundary and is full back country conditions with school bus sized cornices all over the ridge. On Friday January 10, 2014, at 5:38 p.m., the West Yellowstone Police Department received a 911 call from a 30-year-old snowmobiler who reported that he and his 27-year-old friend were lost, their snowmobiles were stuck, and they were tired and hungry. The police dispatcher was able to get GPS coordinates from the caller’s phone, which showed that they were in the Lionhead area west of West Yellowstone. Personnel from the Sheriffs Office, the West Yellowstone Division of Sheriff’s Search and Rescue, and the U.S. Forest Service responded.